Paint & Beer: Grafik Warfare prepair to take Amsterdamn by storm! 4th year in the running! Its back. Book your flights.. skive off work, just don’t miss it!! 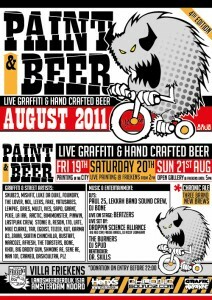 2 whole days of paint fueled creativity, badass tunes & more gourmet beer than you can shake a paint tin at. Grafik Warfare plus some of europes best street artists will be converting a huge warhouse in Amsterdamn into a graffiti explosion!